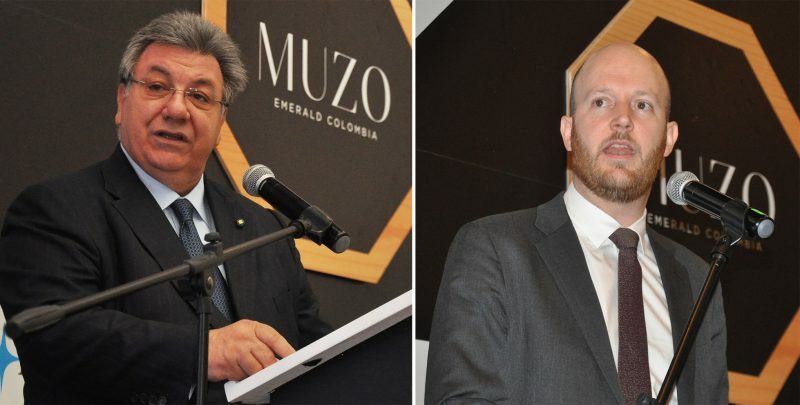 ABOVE: Dr. Gaetano Cavalieri (left), CIBJO President, and Tyler Gillard, head of the OECD Responsible Mineral Supply Chain project, addressing the Opening Session of the 2018 CIBJO Congress in Bogotá, Colombia, on October 15. The 2018 CIBJO Congress has opened in the Colombian capital of Bogotá, with a strong focus on responsible sourcing in the jewellery industry. This included the introduction of a Responsible Sourcing Guidance document, which will serve as a reference for responsible sourcing practices developed and applied by industry organisations and commercial bodies worldwide, and will come to have the status of a CIBJO Book. To oversee the process, a Responsible Sourcing Commission was established. Dr. Cavalieri explained that an operating principle of the Responsible Sourcing Guidance document was that it would be inclusive, meaning that there is an expectation that the standards, guidelines and systems that it describes can reasonably be applied by all members of the industry, irrespective of size or financial capacity. “Like the other CIBJO Blue Books, the standards and guidelines contained in the Responsible Sourcing Guidance document are recommendations, as opposed to conditions of membership. However, they should come to serve as benchmarks for responsible sourcing systems developed and applied by industry organisations and commercial bodies worldwide, and for governments that may seek to create viable regulatory systems. Also, like the other Blue Books, the Responsible Sourcing Guidance will be a living document, which will be reviewed on a constant basis, and amended if changing conditions make it necessary,” Dr. Cavalieri stated. CIBJO’s Responsible Sourcing Guidance is based on the OECD Responsible Supply Chains of Minerals from Conflict-Affected and High-Risk Areas, and supports the Kimberley Process and UN Guiding Principles on Human Rights. Delivering keynote addresses, both during the Opening Session and during a special Responsible Sourcing Session that was held on the first day of the CIBJO Congress, was Tyler Gillard. He heads the OECD’s team working on due diligence in the mining and metals, financial, textiles, oil and gas and agriculture sectors, and additionally leads the multi-stakeholder negotiations for the OECD Due Diligence Guidance for Responsible Supply Chains of Minerals from Conflict-Affected and High-Risk Areas. CIBJO had consulted with the OECD and other key industry associations in formulating its guidance document. Mr. Gillard insisted that the OECD understands the challenges faced by the many smaller and medium-sized bodies in the jewellery industry in instituting its due diligence standards, and especially small-scale and artisanal miners. “We don’t require full traceability from mine to consumer, but that you are exhibiting a strong degree of commitment,” he said. “I emphasise that due diligence is a process, and that it won’t be completed overnight. But you must show good faith that you are doing it,” he said. The President of the new Responsible Sourcing Commission is Philip Olden, who has developed responsible sourcing protocols and guidance for leading international companies in the jewellery and gemstone sectors, and who oversaw the creation of CIBJO’s Responsible Sourcing Guidance document. The commission’s two vice presidents will be Tiffany Stevens, President and CEO of the Jewelers Vigilance Committee in the United States, and Erik Jens, an independent financial consultant for the jewellery and gemstone sectors and former head of the diamond and jewellery division at ABN AMRO Bank. Serving as the official venue for the meeting of the CIBJO Assembly of Delegates, the CIBJO Congress gathers the members of national jewellery and gemstone associations from more than 40 countries and representatives of many of the industry’s most important commercial bodies. During the event, the organisation’s Diamond, Coloured Stones, Pearl, Coral, Precious Metals and Gemmological Blue Books, which are industry’s most widely accepted directories of uniform grading standards and nomenclature, are discussed and updated. The congress is being hosted by Fedesmeraldas, the National Federation of Emeralds of Colombia, and CDTEC, Colombia’s leading gemmological institute.